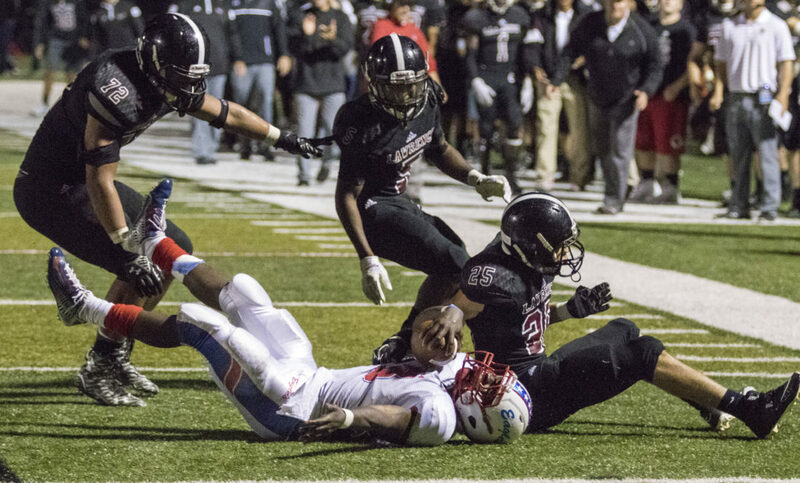 Lawrence High senior Price Morgan (81) lays a hit on Olathe North senior running back Vinson Shabazz, left, as Price and teammate Tanner Green bring down Shabazz for a loss during their game Friday evening at LHS. 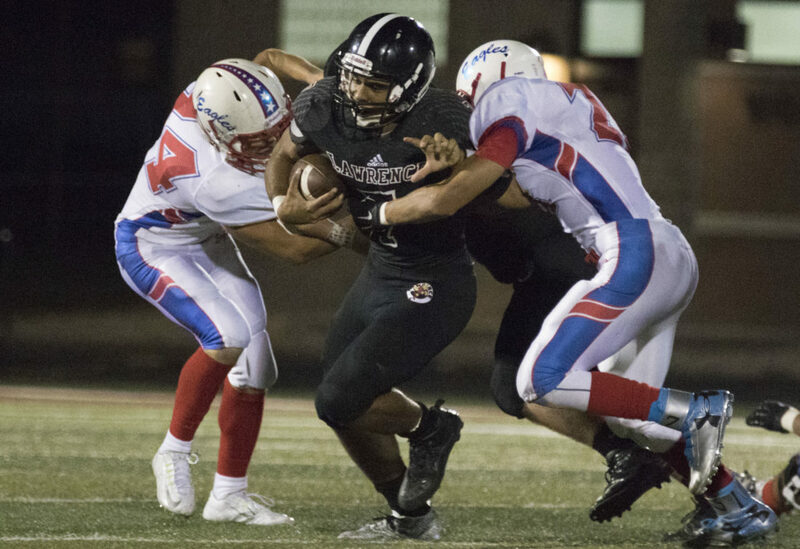 Lawrence High's Amani Bledsoe (72), Ivan Hollins (5) and Santino Gee (25) work to bring down Olathe North senior running back Vinson Shabazz behind the line of scrimmage during their game Friday evening at LHS. 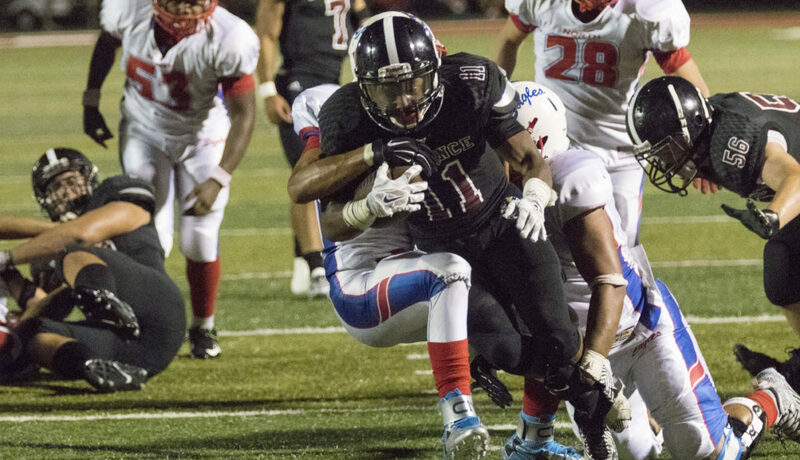 Lawrence High senior running back JD Woods (11) drags a pair of Olathe North tacklers along with him as he picks up extra yards during their game Friday evening at LHS. 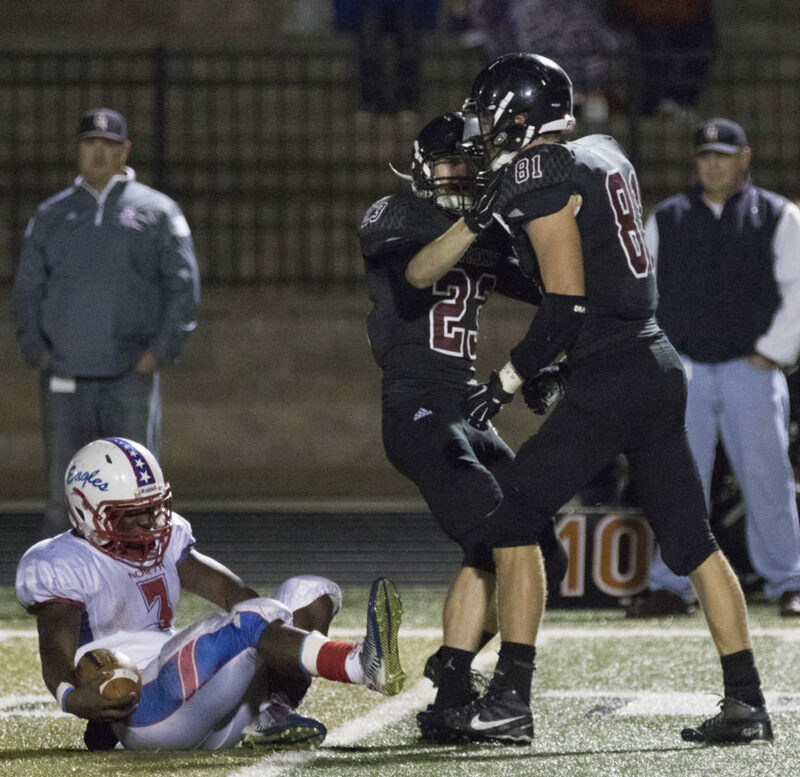 Lawrence High's Erik Shackelford (23) and Price Morgan (81) celebrate after bring down Olathe North senior running back Vinson Shabazz (3) for a loss during their game Friday evening at LHS. 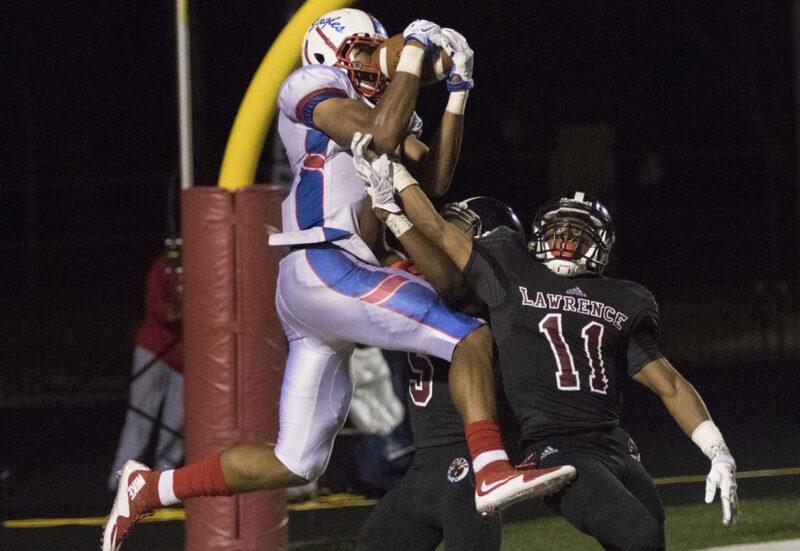 Olathe North senior receiver Isaiah Simmons out battles Lawrence High seniors Ivan Hollins (5) and JD Woods (11) as he pulls down a late fourth quarter touchdown to give the Eagles the lead during their game Friday evening at LHS. 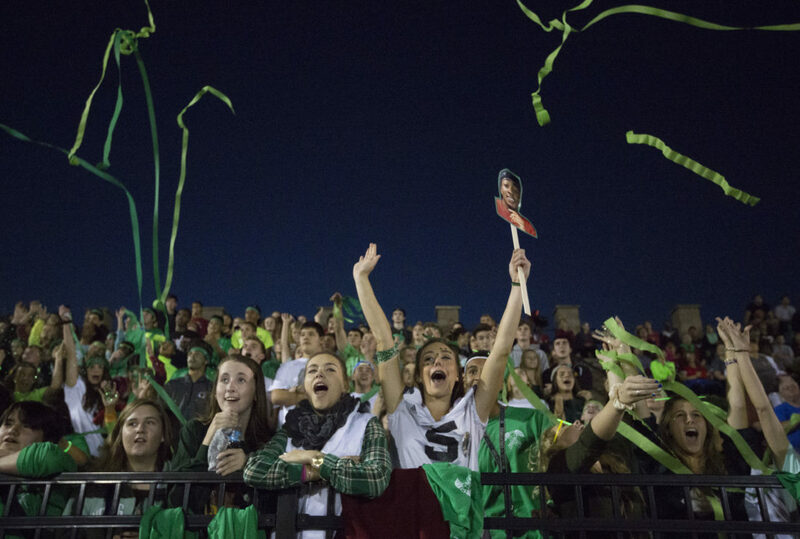 Lawrence High students cheer and throw streamers in the air during the opening kickoff of the Lions' game against Olathe North Friday evening at LHS. 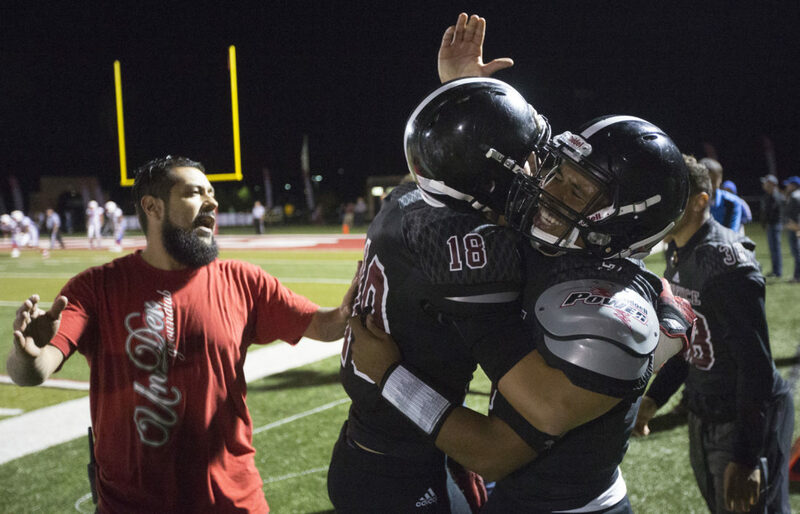 Lawrence High seniors Luke Padia (18) and Alan Clothier hug and celebrate on the sideline after the pair hooked up for a 26 yard touchdown pass with four seconds left in the fourth quarter to give the Lions the lead in their game against Olathe North Friday evening at LHS. 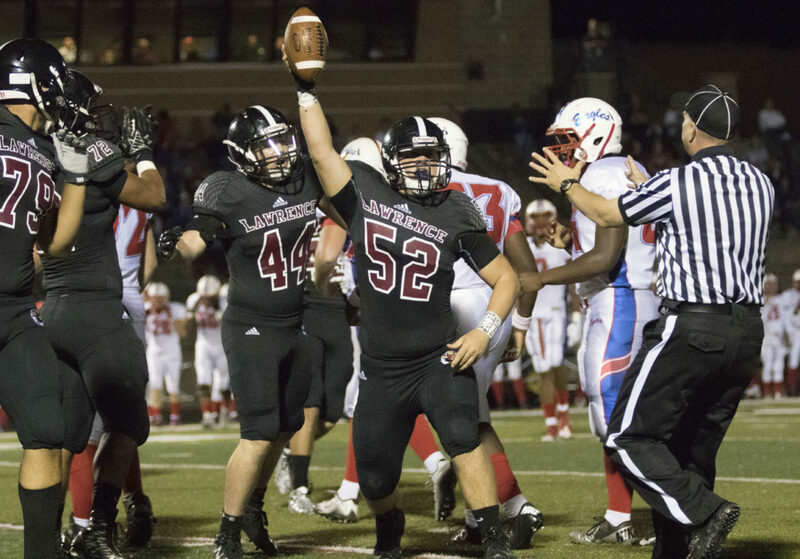 Lawrence HIgh junior linebacker Jake Unruh (52) holds the ball up after recovering a fumble during the Lions' game against Olathe North Friday at LHS. 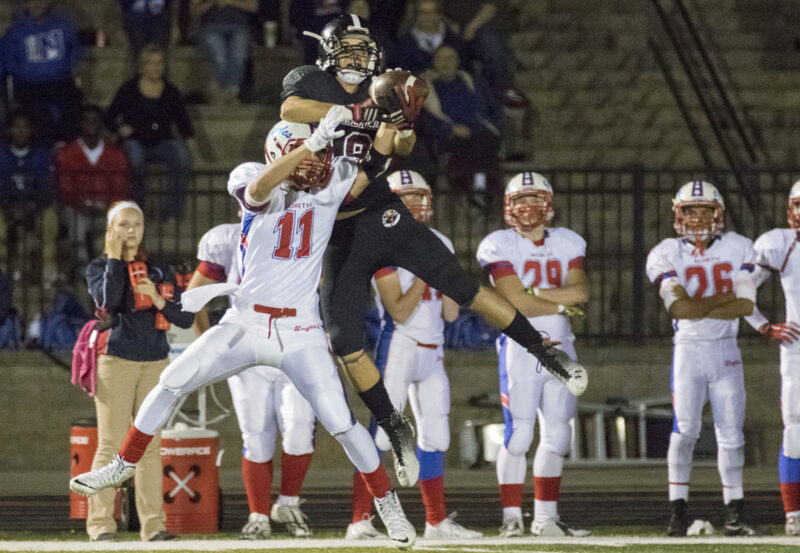 Lawrence High senior receiver Luke Padia takes the ball away from Olathe North senior defensive back Jake Campbell (11) for a 58 yard touchdown during their game Friday evening at LHS. 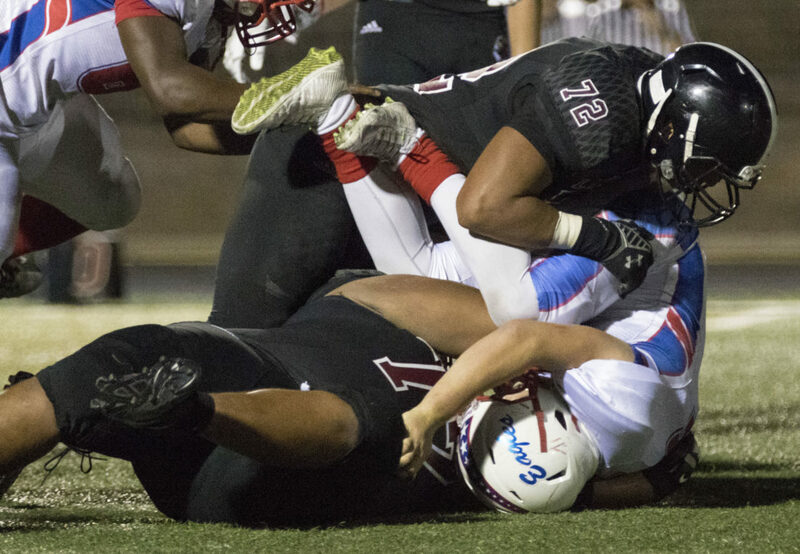 Lawrence High senior defensive linemen Amani Bledsoe (72) and Nate Koehn (77) turn Olathe Norht senior quarterback Matt Wright upside down as they bring him down during their game Friday evening at LHS. 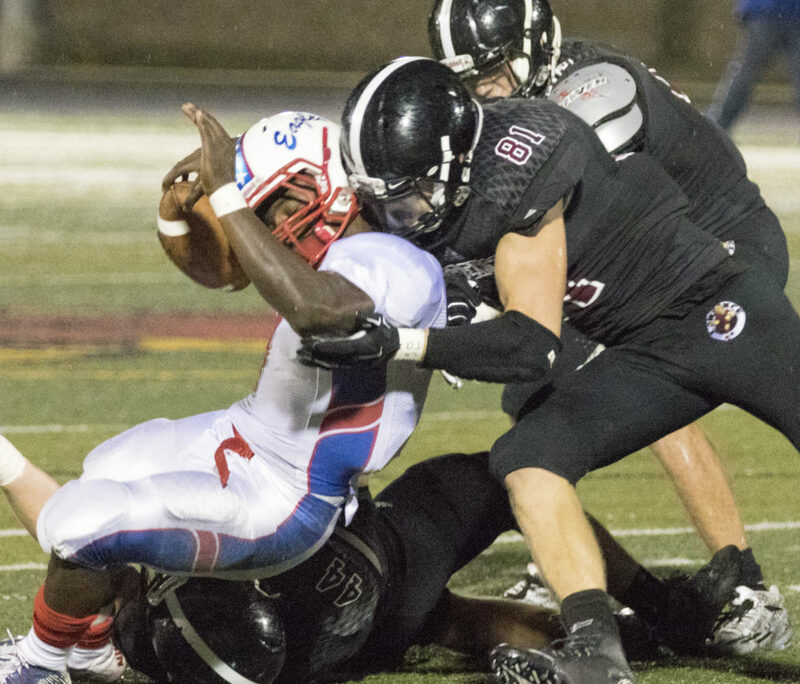 Lawence High senior quarterback Alan Clothier, center, breaks through a tackle attempt by Olathe North's Zach Jaso, left, and Deion Poindexter, right, during their game Friday evening at LHS. 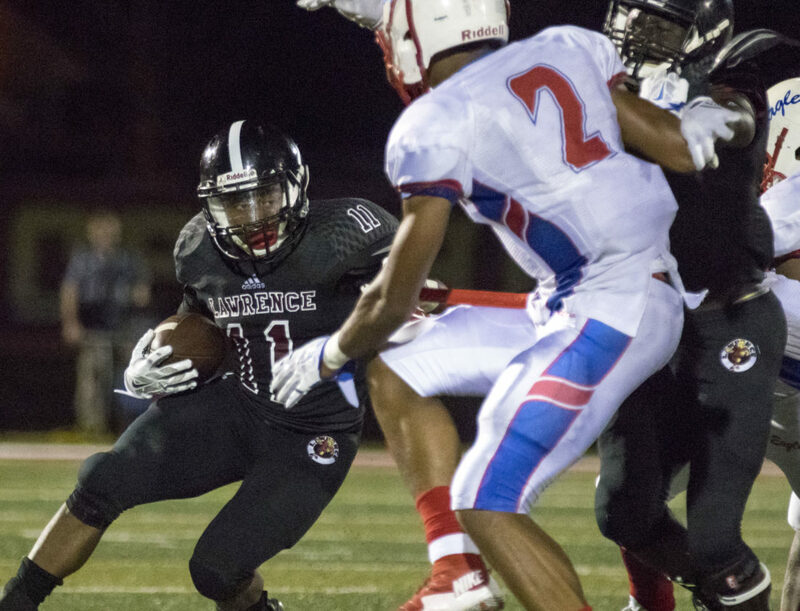 Lawrence High senior running back JD Woods (11) looks for a cutback lane as Olathe North senior Isaiah Simmons (2) closes in during their game Friday evening at LHS. 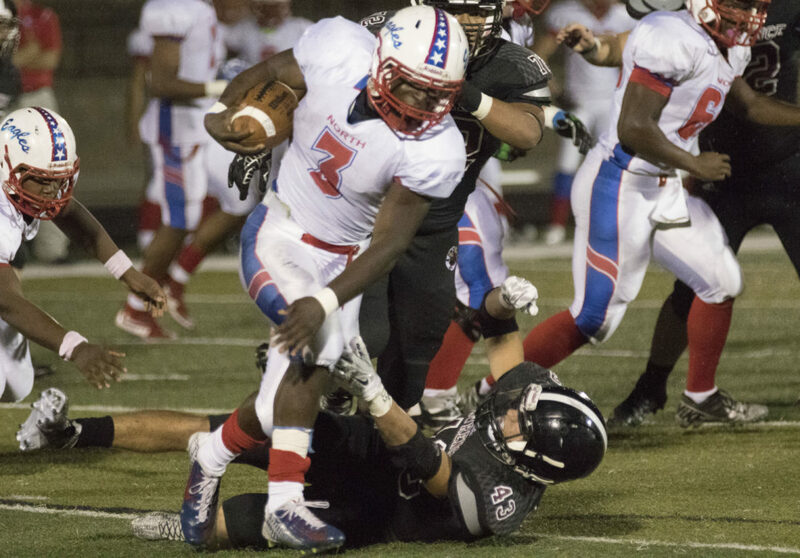 Olathe North senior Vinson Shabazz (3) runs through a tackle attempt by Lawrence High senior Konner Kelly (43) during their game Friday evening at LHS.